It seemed like spring was a long time coming this year, but all of a sudden it is racing along too quickly. I guess it's like that every year, but the things that usually bloom in February were late to get going and didn't emerge until mid-March. Then everything started at once. I am reminded of the cliche about how slow life seems to unfold when you're young, and then all of a sudden you're your parents' age, and the years start barreling by. I'm caught in that web right now. Inside, I feel like an 18 year old, but I wake up every morning in amazement at my age. I feel very, very grateful to be here, but still it's a shocker to realize that all but one of the relatives of my parents' generation are gone from this world. I'm at the top now! But, back to spring. It wasn't even a week ago that I captured this photograph of Viburnum juddii. That day, I had gotten out of my car and knew that one of Margaret Moseley's fragrant viburnums was in bloom. I had to get Margaret, who is totally bedridden, but still has a sharp mind, to tell me which viburnum was next to the carport. How amazing that at almost 99 years old she can know immediately the name and location of the shrub she planted decades ago. On Sunday, when I revisited the garden, the flowers were just a little past their prime. But others were coming on. Near the back of the garden, another fragrant viburnum (V. x burkwoodii 'Mohawk') was wafting its scent in the cool breeze. When I go out there next week, I feel sure her Viburnum carlesii (Korean spice viburnum - the first one she ever planted) will be in flower. It's heavily budded now. It, too, is highly fragrant. Last to bloom of the fragrant viburnum series is V. x carlecephalum. It has the biggest rounded flowers of the scented types. Margaret collected viburnums, so there's not much she doesn't have. I didn't see her more tender V. tinus this year. It could have died or gotten cut down by mistake. The macrocephalums and the plicatums will follow. They are not fragrant but are showy. In the book Margaret Moseley's A Garden to Remember, I explain that Margaret formed her garden by collecting four types of plants: viburnums, hydrangeas, Camellia sasanqua and Camellia japonica. She had all types of shrubs, trees and perennials, too, every one of which she planted herself, but the garden's seasons revolved around those collections. She's always thought that collecting was a good way for a beginning gardener to get organized - and the chase for the different types was always challenging and fun. 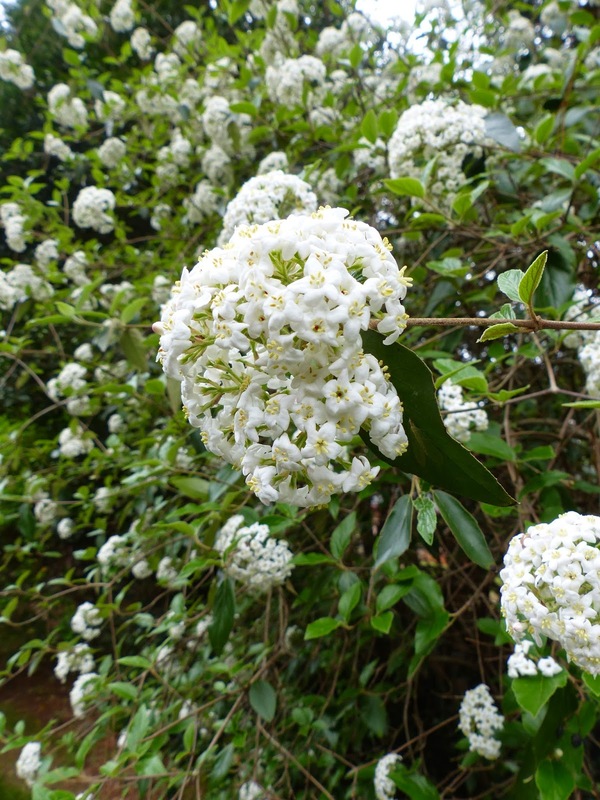 "Dear Margaret~You introduced me to viburnums, and now they are one of my favorites - just like you! Love, Marsha"
"Gardeners never grow old...the future is always more exciting than the past. Pleased to know that there are two viburnum lovers in this world. My best, Michael Dirr, 2008." Even though Margaret has grown old if you count age, she never did become an old gardener. Every season was special, every new bud opening a joy. That's the long-term message she has for younger generations. 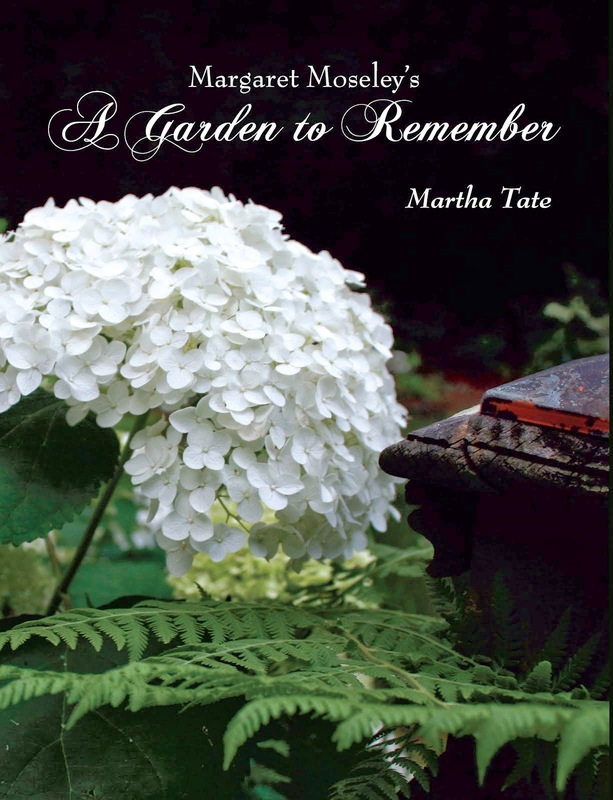 If you read the book about her, or if you walk out into the garden she created and tended for four decades, you somehow come away with the exhilarating feeling that when it comes to a garden, the future is indeed "always more exciting than the past." My college friend Lee Sessions is a native of Marietta, Georgia, and his mother was a cousin of Elizabeth Lawrence, to my mind the greatest garden writer who ever lived. Lee just sent me the outline of a lecture given about Miss Lawrence, sent to him by yet another relative. Margaret Moseley, as I have mentioned before and devote a chapter to in A Garden to Remember, revered Elizabeth Lawrence, had all her books and could quote long passages from them. I found it interesting in what Lee sent me that Miss Lawrence was born on May 27 (my birthday). Margaret's next birthday will be May 28th. She will turn 99. So much of Margaret's view of gardening and her interest in plants and handling them herself parallel the same opinions held by Miss Lawrence. I do think that if Margaret had not stumbled upon her books, she would still have been out there every day, moving and sharing plants and corresponding with other gardeners she met through the Farmers and Consumers Market Bulletin (published by the Georgia Department of Agriculture). Margaret sold poppy and impatiens seeds through the ads and had a lively correspondence going with those who bought from her. The intent was never to get rich (hardly possible at .50 or $1.00), but to make sure others could have plants to enjoy. Margaret also read extensively - everything she could get her hands on - and welcomed visitors to her garden. You could be sure you'd drive away with a plant and with your heart beating so fast with inspiration to go home and garden with the same enthusiasm and joy as Margaret. I took the photograph of this daphne in her garden last Saturday. Margaret is confined to bed now. Her gardening days are behind her. She still greets you with a laugh and the sharpest mind. "Oh my, look who's here." The above scene says a lot to me. I had another view of green grass paths and camellias in bright red and pink. It was hard to choose which to show. Both reminded me of how Margaret would call me on the dullest days of winter and tell me that her garden was the prettiest it had ever been. This didn't happen a few times. It happened dozens of times each year. Margaret was a hands-on gardener. She dug the holes herself and ended up with a year-round garden - one that thrilled her no matter what the season. She was out there every day. So, when I was reading passages from the Elizabeth Lawrence lecture, I landed on this one: "I never did care for fair weather gardeners. Standing behind glass doors, they look out at the cold ground and leafless branches and exclaim, 'How beautiful this must be in spring.'" This never applied to Margaret. Yes, her garden was beautiful in spring, but with all the daphnes, hellebores, camellias, the Prunus mume (she has several), the rare and stunning Michelia maudiae,the leaves of Arum italicum and variegated money plant and Edgeworthia chrysantha and early daffodils, she never, ever looked out without seeing something beautiful - all due to her own creative spirit and hard work. Where have I been for a month that I could not sit down to write? The answer is "nowhere." And, it's not as if the muse has left me completely. It all has to do with how I manage my time, my bad habits (procrastination being at the top of the list), visitors from out of town (spent an entire week trying to make the house seem cleaner; finished right before they walked in the door). Then, my spare time on decent days, I tried to get out to see Margaret Moseley, who is now bedridden, I'm sad to say. Throw in five whole days of going through 28,000+ unlabeled (for the most part) photographs to make up a new Power Point presentation for a garden club, and...well, I'm wasting time with excuses. Oh, wait a moment. I do have a daughter's wedding coming up two months from tomorrow. That takes a lot more time than I'd counted on. But, that's it. It's a beautiful, actually hot day, and I did just get a bit of shaping done of the wild-looking boxwoods on my terrace. And, after I write this, I'm going out to inspect the soil in an area where I'm going to move some camellias. After the winter wind and sun blasted three of them (the two red ones did fine), I've got to give some protection to the light pink and white ones I bought a couple of years ago. They're in the wrong place - too exposed to harsh elements. Then, there is the matter of the bearded iris I didn't move last August when I should have. They are pot-bound, and I don't expect much this year. But, at least I can free them from the confines of their root prison (I've moved bearded iris before at the wrong time, and they did fine). And, one other chore. There is an abandoned property where there are more bearded iris. They need dividing. After two attempts to contact the owner, who, I think, lives half-way around the world, I think I'm going to dig half of each clump, leaving the main part intact. So much Vinca major has grown up around them that they're hard to see. I've been going up there and pulling English ivy off the beautiful old trees. I can't stand seeing them being devoured by a thug. I have to get this done now, as I don't want to encounter any snakes. There are too many excellent hiding places up there. I'm rambling here. It's been so wet and gloomy that I haven't had the gumption to get much done. So, on a day like today, when there are so many choices, I'm spinning around, trying to figure out what to do next. I offer above a scene from Liz Tedder's multi-acre garden near my hometown. These are some Japanese iris in her potager. If you look closely, you'll see I had my camera sticking through a fence. The edges are just visible. On the subject of this photograph, I first wrote down that these were Siberian iris. Then, it dawned on me that I took this picture on May 31, 2014, which means that it was too late for Siberians and just right for Japanese (Iris ensata). I must really be getting rusty! Plus, look at the size of the bloom and the height. Somehow the perspective threw me. Since I'm already rambling, I can't help but look at this beautiful potager without a bit of envy - full sun, flat, even ground, soil so rich and loose you can reach down to your elbow (the Tedders go around Newnan every fall and pick up leaves and grind them for the garden). And the amount of work -it's full time, every day, every season. I have to be realistic and work with what I have. But, I can do better, and now that the weather is looking up, I'm going to get these immediate chores done and then have some fun creating another garden spot or two. After all the cold, rainy days, just the thought of all this makes my heart beat faster.